QupZilla is a free and lightweight multiplatform web browser. It allows seamless integration with users' desktop environments and has several distinguishing features positively received by reviewers. Gwenview is a fast and easy to use image and video viewer. Gwenview features two main modes: Browse and View. Both modes can be used in a normal application window and Full Screen. Browse Mode lets you navigate through your computer showing thumbnails of your images, View Mode lets you view images one at a time, and Full Screen lets you make quick slideshows. There is also a start screen that displays a list of recently opened folders and URLs as well as your places and tags. Image loading is handled by the Qt library, so Gwenview supports all image formats your Qt installation supports. Gwenview correctly displays images with an alpha channel (transparency) as well as animations. 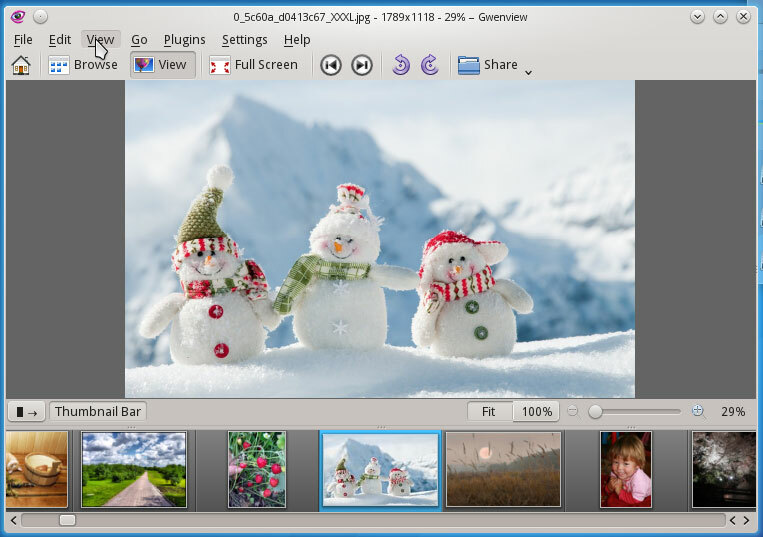 Gwenview supports the displaying and editing of EXIF comments in JPEG images. Lossless JPEG transforms such as rotations and mirroring are also supported. Gwenview can read embedded color profiles from PNG and JPEG files. It can use the image color profile together with the display color profile to output correct colors on the screen. Featuring a simple (like Nero), yet powerful graphical interface, K3b provides various options for burning a CD, DVD, or BD (Blu-ray disc). Various types of optical projects are supported including (but not limited to) audio and data, video projects for DVD and VCD, as well as multi-session and mixed-mode discs. K3b also has the ability to erase re-writeable media and can perform more complicated tasks such as audiovisual encoding and decoding. KMix supports several platforms and sound drivers.If you have both ALSA and Open Sound System drivers installed, KMix will use the ALSA driver. Okular is a KDE universal document viewer based on the code of the KPDF application. Although being based on KPDF code, Okular has some unique features such as overview mode, improved presentation support and annotation support. Okular supports a lot of different formats like PDF, PostScript®, Tiff, CHM, DjVU, Images (png, jpg, etc.) XPS, Open Document (ODT), Fiction Books, Comic Book, Plucker, EPub and Fax. For all supported formats and their features see Okular Document Format Handlers. This is a text editor for KDE version 4 and above. Some of Kate's many features include configurable syntax highlighting for languages ranging from C and C++ to HTML to bash scripts, the ability to create and maintain projects, a multiple document interface (MDI), and a self-contained terminal emulator. But Kate is more than a programmer's editor. Its ability to open several files at once makes it ideal for editing UNIX®'s many configuration files. Kompare is a GUI front-end program that enables differences between source files to be viewed and merged. Kompare can be used to compare differences on files or the contents of folders. The KInfoCenter provides you with a centralized and convenient overview of your system and desktop environment. The information center is made up of multiple modules. Each module is a separate application, but the information center organizes all of these programs into a convenient location. This next section details the use of the information center itself. For information on individual modules, please see Default KInfo Center Modules. Dolphin is the default file manager for KDE, designed with usability as a primary focus. Dolphin is KDE's default file manager. It aims to improve usability at the user interface level. Dolphin focuses only on being a file manager whereas Konqueror, which was KDE's default file manager in KDE 3 and can still be used for file management, is a universal viewer for many file types. This design approach allows the developers to concentrate on optimizing the user interface for the specific task of file management. System Monitor is the KDE Task and Performance Monitor. It features a client/server architecture that allows monitoring of local as well as remote hosts. The graphical front end uses so-called sensors to retrieve the information it displays. A sensor can return simple values or more complex information like tables. For each type of information, one or more displays are provided. Displays are organized in worksheets that can be saved and loaded independently from each other. So, System Monitor is not only a simple task manager but also a very powerful tool to control large server farms. Ark is a program for viewing, extracting, creating and modifying archives. Ark can handle various archive formats such as tar, gzip, bzip2, zip, rar, 7zip, xz, rpm, cab and deb (support for certain archive formats depend on the appropriate command-line programs being installed). 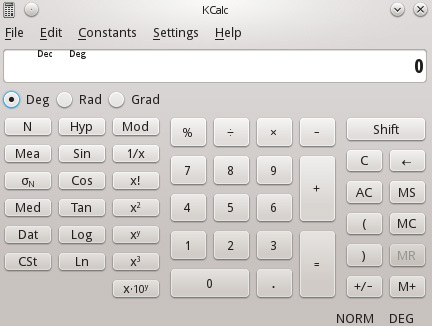 KCalc is a calculator for KDE. In the simple mode it can be used for basic arithmetic operations, but provides advanced modes for scientific, statistical and numeral system calculations. 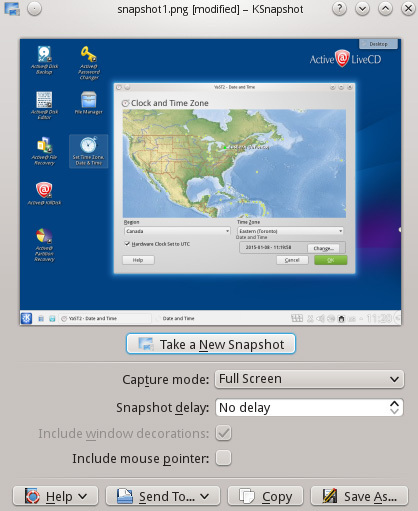 KSnapshot is a simple application for taking screenshots. It is capable of capturing images of the whole desktop, a single window, a section of a window, a selected rectangular region or a freehand region. The images can then be saved in a variety of formats.